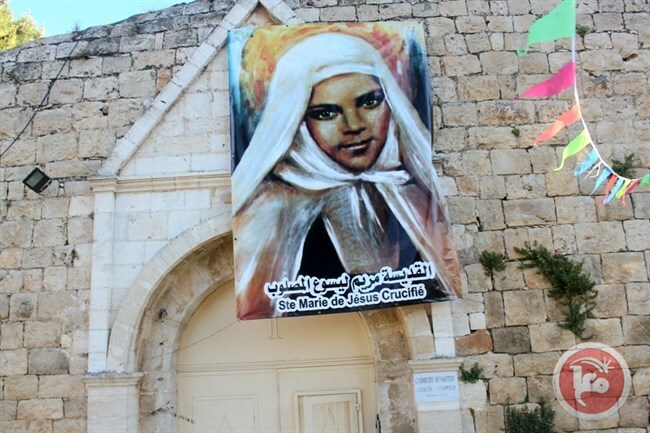 BETHLEHEM (Ma’an) — The grounds of the Carmel Convent in Bethlehem, home to blue-shuttered stone buildings on a hilltop facing the Nativity Church, are adorned with the image of Mariam Bawardy, one of two Palestinian nuns canonized by Pope Francis in Rome on Sunday. Tucked away from the traffic-filled streets of central Bethlehem, the serene convent founded in 1876 is a testament to the life work of the Galilee-born nun, now home to 15 sisters from Palestine, Europe, and Latin America. “She was a very humble person, full of love and vitality, a complete human being,” one of the sisters at the convent told Ma’an, a sense of pride in her voice. Her room at the convent has been well preserved by the sisters, with a white prayer gown hanging on the wall and the remnants of her bandages kept behind glass – the nuns say she suffered from stigmata, the wounds of Jesus Christ, until her death at the age of 32. The historic ceremony at the Vatican, attended by an array of regional church leaders and President Mahmoud Abbas, celebrated for the first time the veneration of two Palestinian saints – Mariam Bawardy and Marie Alphonsine Ghattas, who was born in Jerusalem in 1846, then under Ottoman rule. Giant portraits of the women hung high in St Peter’s Basilica facing the crowds, including 2,000 Palestinians, who had gathered for the canonization, with Pope Francis calling the two Palestinian women a “luminous example” for Catholics to follow. Bawardy was born to a Greek Catholic family and lived in Egypt, France, and India before moving to Bethlehem. Orphaned and illiterate, she suffered dire poverty and tragedy in early life. While living in Alexandria at the age of 12, she rejected her uncle’s attempt to marry her off and had her throat slit after she refused a servants’ demands to convert to Islam, with her recovery prompting her to enter the church and provide charity to poor families across the Middle East. Ghattas, known for her piety and love, set out on an educational mission and founded the Congregation of the Holy Rosary, leaving behind a network of convents, schools and religious centers in the Middle East. She is said to have performed many miracles in her life and to have seen the Virgin Mary in several apparitions. The historic recognition of the first Palestinian, and indeed Arabic speaking, saints came only days after the Vatican announced the first bilateral treaty with the State of Palestine since official recognition two years ago. With a stalled peace process, a decidedly right-wing Israeli coalition, and internal Palestinian division, the recognition of two Palestinian saints – the highest honor bestowed by the Catholic Church — has been interpreted as a positive intervention by the Vatican in the Israeli-Palestinian conflict. “This is a strong message from the Holy See, from his holiness, that he cares for Palestine and the Palestinians,” Ambassador to the Holy See Issa Kassissieh told Ma’an. Rifaat Kassis, a prominent political community activist and coordinator of Kairos, a local Christian group, says the canonization is significant on many levels, notwithstanding the recognition that Palestinians under Ottoman rule were part of a diverse, productive society, contrary to the mainstream sidelining of Palestinians from the region’s history. “This puts Palestine on the map, among not only the catholic world, but the whole world, and I think this will also help people to understand Palestine and the occupation,” he told Ma’an. The treaty announced last Wednesday will deal with the “life and activity of the Catholic Church in Palestine,” according to the Vatican’s website, and essentially covers issues such as Vatican property, taxes and protocol at holy sites. The treaty also made reference to diplomatic relations with the State of Palestine, as opposed to the PLO, a clear shift in direction. “This a step forward for a two state solution, or a solution. The Vatican now recognizes the state, and this will make it easier for others to recognize it and forces Israel to make peace,” Yusef Daher, executive secretary of the Jerusalem Inter-Church Centre, told Ma’an. “We are very proud that our dear land has produced two important persons, humble poor persons who became sanctified by the Vatican. A representative from the media office of the Latin Patriarchate of Jerusalem said that the canonization of the two Palestinian saints is at heart a spiritual event which could have a social impact in teaching Palestinians about how to “live with serenity in the midst of all our problems,” an existential inspiration rather than a political influence. It is also a message to the world that the Middle East is not just about media headlines on IS and irrational violence, that the Arabic speaking people have a rich history and there are diverse communities in the Middle East, such as the Christian minority whose presence dates back to the time of Christ. “It shows that this land is not a violent land, that there are people working for peace and tolerance. It is a land which stands for serenity too,” the Latin patriarchate representative said.